As promised, we're doing a pre-season tomato workshop! Jason Grauer will share tomato growing techniques for small market growers, from selecting varieties and propagating seedlings to trellising and pruning. 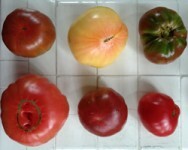 Sam Anderson will also review some of last year's worst tomato pests and diseases in NYC and what to do about them.